I’ve been looking forward to this movie for a long time—but not as long as my sister! She’s intensely interested in selkies, and she’s a big fan of Cartoon Saloon’s last movie, The Secret of Kells. Naturally, she was thrilled when Song of the Sea was announced, and she’s followed its production closely for the last few years. 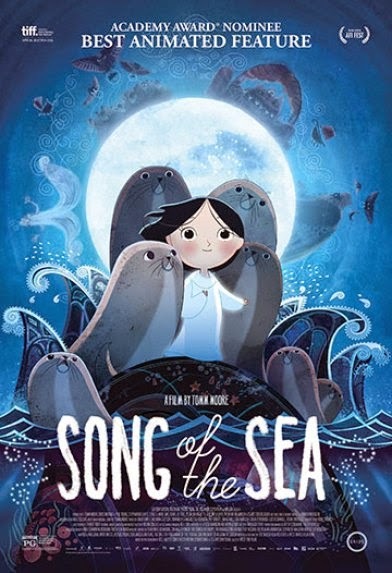 If you enjoy my books—and chances are that you do, or you probably wouldn’t be reading my blog—then I think you’ll find a lot to love about Song of the Sea. Looking at it as a writer, it’s exactly the kind of story that inspires me and gets me excited about storytelling. In particular, it got me excited about the stories I’m telling right now, because it’s a shining example of what a story in my current genre can achieve. Yes, Song of the Sea and the Flicker series are stories in the same genre! They’re both urban fantasy. More specifically, they’re both urban faerie. I’ve never seen an urban faerie story told in this medium, and I think this movie opens up a whole realm of possibilities for other projects like this. (You know, if Flicker were ever adapted into a movie, my dream would be for it to be animated. In my head, the story has always looked like an animated movie. Let me tell you: Song of the Sea is full of faeries—the otherworldly, folkloric kind. There are selkies, of course, but there are also members of the Daoine Sidhe (specifically stated to be such, too, which came as a pleasant surprise to me). A few other figures from Irish mythology appear, including Macha. Previous knowledge of Irish folklore and mythology isn’t necessary to enjoy the movie. But if you’re a bit of a folklore buff like me, I urge you to check it out for the references alone. I would be remiss not to gush about the animation: Song of the Sea is an absolute visual treat, lovingly animated by hand. Animation aficionados, take heed: I promise you’ve never seen anything like it. Personally, I could stare at the backgrounds all day. Please, do yourself a favor and watch Song of the Sea. You deserve it!